An Independant Dance Venue for Lovers of Argentine Tango in Perth WA held on the 3rd Saturday of every month. Practicawest ran its final Milonga last night. We have decided that after two years with all the work that is involved in putting the monthly Milongas together, that it is now time for us to look at Tango for ourselves. We are proud to have achieved our goal with Practicawest in providing an alternative 'club style' venue for the Perth Tango Community. It truly has been a labour of love. We do thank you for your support over this time. Hi Tango Enthusiasts!! Happy New Year!! Thanks to those who joined us last night for our New Year's Eve Ball. Joseph and Peter won the door prizes and Petra and Antonio won the Spot prizes, although Antonio won by playful and cheeky means. Thanks Clare for helping us with the set up and your yummy food contributions. We had a banquet feast to satisfy all. It was also Practicawest's second anniversary so a very big thank to you all for your support. Our next Milonga will be Saturday 18th January 8.30 till Midnight - $10 includes nibblies and refreshments. In the meantime Tangospace will be running their monthly Milonga 11th January in Applecross. What a fantastic experience we had attending the Wuppertal Tango Festival in Germany this month. The standard of dance at the Milongas was like having the Cream of Tango all in the same place at the same time and what welcoming friendly people they were towards us. The Milongas ran all night every night at Cafe Ada and the Germans really know how to Party!! The Grandeur of the Ball at the Historical Stadhalle on the Saturday night was just pure opulence. The Band - Bell Tango from Belarus are all Professors of music. It was an elegant affair not to be missed. As we had booked months in advance we had prime seating for the performances. In visiting Wuppertal, the airport is at Weeze close to Dusseldorf, but there is no need to stay at Dusseldorf ready for the flight out, we stayed at Kevelaer a picturesque town with church bells ringing out many times during the day. The town would be typical of any European Christmas Card it was so pretty and with great shopping too! During our time away we also spent time in Rome. We visited Il Giardino Del Tango, a Milonga, Ristorante and Pizzeria. The Venue is actually a huge marque. 10 Euros entry or 15 for entry with a meal and drink. We had choice between the Argentinian or Italian Meal on the night. We chose Argentinian which were lovely Empanados with Salad. Classes ran from around 6.30 until 10.30 most nights then the Milonga until 3am. This particular night was rather quiet the owners told us as Roma was playing Napoli at the football oval close by. At the end of the night the owners, Valerio and Alessandro opened a bottle of Champagne for us which we were greatly humbled by. We were introduced to many people there and really made to feel at home. They gave us free entry for the following night where they had 200 already booked and we were also promised a good table. Well they didn't get their 200 people, they got over 220!! Another fantastic night of Tango and we once again received complimentary Champagne. One lady told us Carlos Gavito used to attend the venue and how much she enjoyed dancing with him. Paris Milongas however were rather a let down, which had not been so in the past. A few we visited were not running or had moved. Web information was incorrect or on one occasion a Milonga was running but there was a door code for entry, which of course we did not have. We attended the following night where we learnt it was Latino night and the Milonga was the previous night. There were only two good Milongas we attended, La Tanguedia De Paris & Intensive Danse, easily found from web info and no door codes. Great Milonga in Edinburgh once again very welcoming and friendly people ...one young lady wanted us to stay and teach. Vienna Tango was a mixed bag, one venue being too bright with no atmosphere. A Dutch lady told us she was not impressed and not coming back to Vienna for Tango, a Local fellow reading our T'Shirt "For Funky Tango" said in jest, they specialise in socially depressive Tango there. Another Milonga not so friendly leaving us to find our own taxi out on the street. All other venues rang a taxi for us. However then we discovered Galeria Ideal later in the week. Ideal being the word, absolutely Ideal! Christian the owner, lives in Argentina much of the time but also has his venue in Vienna. We arrived a bit too early and he made us proper espresso coffee while we waited. We were introduced to Andrés Molina and Cecilia Piccinni who had just finished touring and attended on the night for a social dance, they performed for the crowd. A beautiful humble couple who showed us their relaxed quality performance. Hopefully they will visit Perth in the future. We had been receiving mail out emails from Tango Pasional Vienna for many months but were very much let down when we actually visited them. Their venue was in the same street we were staying and we attended one afternoon when the doors were open. They were in the middle of a class but we were kept waiting at the door for over half an hour, then we left. We had emailed them prior as well about their times for Milongas but no replies. This venue was not welcoming to visitors at all. We hope to have some photos and videos of the Tango Festival up on our blog but need to first gain permission so hopefully will have that soon. 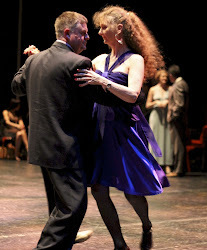 Wuppertal hosted an Awesome event, a recommended Tango Festival. Practica West. Picture Window theme. Theme images by Josh Peterson. Powered by Blogger.